There are many variations of this flavour-packed Catalan sauce, and here is mine. 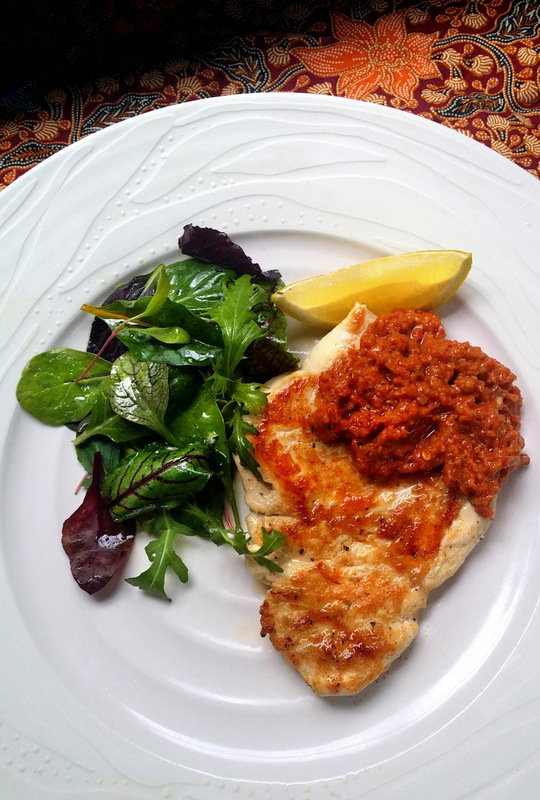 Being a low-carb recipe, it contains none of the fried breadcrumbs sometimes added to romesco sauces. If you're on a low-carb, #LCHF or diabetic diet, I don't think you'll miss the crumbs at all, because the toasted hazelnuts and almonds add lovely crunch, while the fiercely roasted red peppers and tomatoes produce natural sweetness and gorgeous depth of flavour. This is delicious dolloped over flash-fried chicken breasts, and very good with melting aubergine slices, pan-fried fish fillets, braised leeks and plain old hard-boiled eggs. David Walters, Master Potter of Franschhoek. You can whizz this sauce to fine purée, or pulse it in a food processor to a coarse pesto so it has some texture. Because I prefer this sauce slightly chunky, I don't bother to peel the peppers. But if you don't like pepper skin, you can roast the peppers whole in the oven (or blacken them over a flame), then scrape off all the charred skin before you process the sauce. This sauce is traditionally made with mild dried nyora peppers, but as you're not likely to find these in South Africa, I have a specified a pinch or two of dried chilli flakes. Add more if you want a sauce with a memorable kick. It's important to achieve a good balance of sweetness and acidity in this recipe. I've used a delicious Spanish sherry vinegar here but, again, this is not easy to find in South Africa, so I suggest you use red wine or balsamic vinegar, adding it a few drops at a time until you're satisfied with the taste. I use blanched, skinned hazelnuts from Woolies, but if you're not able to find these, you will need to toast the skin-on hazelnuts in a dry pan first, then rub them energetically in a tea towel to remove the skins. Heat the oven to 200 °C, fan on, or 210 °C if your oven has no fan. Lightly oil a large baking tray. Remove the stalks and seeds from the red peppers and cut into big wedges. Cut the onion lengthways into thick slices, and slice the cherry tomatoes in half. Arrange the vegetables in a single layer in the baking tray, and rub a little olive oil over the onion slices. Season lightly with salt and roast in a hot oven for 45-60 minutes, or until the veggies are very soft and have blackened edges here and there. Watch them closely so they don't scorch or stick. While the vegetables are roasting, put the hazelnuts and almonds into a dry frying pan, set over a medium-low heat and cook, tossing frequently, until they are golden brown and lightly toasted. Don't take your eye off them for a moment - they burn in an instant. Add a teaspoon of olive oil to the pan, along with three-quarters of the peeled, crushed garlic. Cook gently, over a low heat, for another 60 seconds, without letting the garlic brown. The idea here is to take the sting out of the garlic. Remove from the heat and set aside. Scrape all the roasted vegetables into a food processor fitted with a metal blade. Add the chilli flakes, the nut/garlic mixture, 2 Tbsp olive oil, the reserved garlic, the vinegar and the paprika. Whizz to a fairly coarse purée - or to a fine paste if that's what you prefer - stopping now and then to scrape down the sides. If the blades are reluctant to turn, add a little more olive oil. Season to taste with salt and milled black pepper. Add a spritz of lemon juice - just enough to 'lift' the sauce. Use a spatula to scrape the sauce into a bowl. Serve immediately, or cover tightly and refrigerate for up to 3 days. To prepare the chicken: Place a chicken breast between two sheets of clingfilm or sturdy greaseproof paper and use a rolling pin (or a wine bottle) gently to bash it out and flatten it so it's of a fairly even thinness all over. The trick here is to start in the middle and work outwards, using gentle thumps that won't shred the chicken or make holes in it. Repeat with the remaining breasts. Turn down the heat, add the butter and a squeeze of lemon juice, season to taste with salt and pepper and cook for another minute, basting the breasts with the butter & lemon juice. Remove from the pan, rest for a minute, then serve hot with the romesco sauce, lemon wedges and baby salad leaves. @Jessica Koller - thank you so much!